The Garden Bird Feeding Survey (GBFS) has charted the use of food supplements by birds in gardens for over 40 years. The network of householders that participate in the survey extends across the UK. For over 40 winters GBFS has charted dramatic comings and goings at bird feeders. The survey has seen this activity evolve from a small-scale pastime based mainly on the provision of kitchen scraps to a multi-million pound industry. 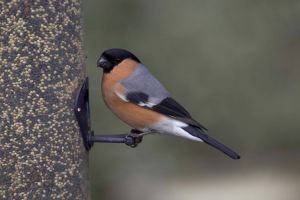 Indeed, it is estimated that around half of UK householders feed birds in their garden providing some 50-60 thousand tonnes of bird food per annum. With increased commercialisation has come a plethora of new bird foods and associated feeding equipment. The GBFS results suggest that these changes have opened the garden gate to many once-infrequent garden visitors. for for an insight into the results from last winter. In addition to regular visitors, many unusual species have cropped up in GBFS gardens over the years. Find out what some of these rarities have been.